Talk about taking it to the next level. Over the past year and a half the Rutgers Department of Classics (School of Arts & Sciences) and Rutgers Center for Digital Filmmaking (Mason Gross School of the Arts) have been collaborating on four separate student-directed films that treat the idea of Rome from one angle or another. Here’s one of them: The Hair Archaeologist. In this short-format documentary film SAS student Jenny Kim ’16 with the help of John Riggio ’16 offer up a five and a half minute profile of noted experimental archaeologist Janet Stephens. 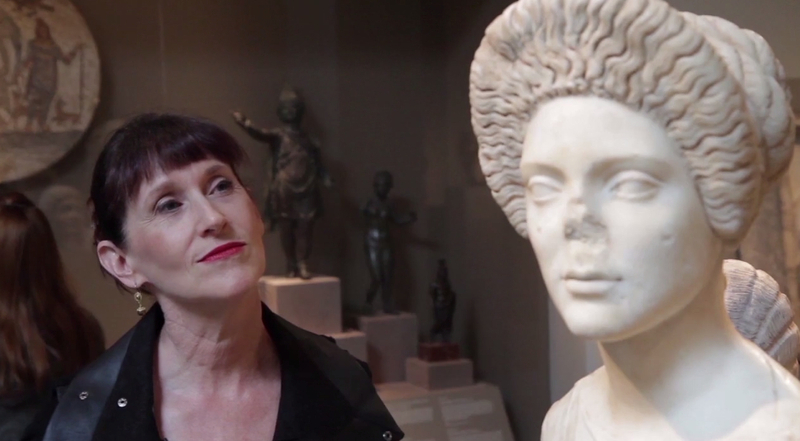 Stephens has published her pioneering work on ancient hairdressing techniques in the Journal of Roman Archaeology and Journal of Experimental Archaeology, and seen her studies featured by the Wall Street Journal, NPR and the BBC. On 23 October 2014 Stephens also delivered the keynote presentation at ‘Ancient Adornment‘, the first-ever Committee on Institutional Cooperation (CIC) graduate conference on the ancient world, which Rutgers Classics hosted. Rutgers juniors Jenny Kim and John Riggio traveled to Baltimore before the October conference to interview Janet Stephens on location at her studio and in the dramatic Sculpture Court of the Walters Arts Museum. SAS student Shaodi Huang ’16 aided with additional film work at the Rutgers/CIC conference itself. Kim then submitted the work to her fall 2014 course Advanced Documentary Filmmaking, taught by the founding Director of the Rutgers Center for Documentary Filmmaking, Professor Dena Seidel. A few more edits, and here you have it. And there’s a lot more to come—all as part of the Rutgers Rome Stories series.